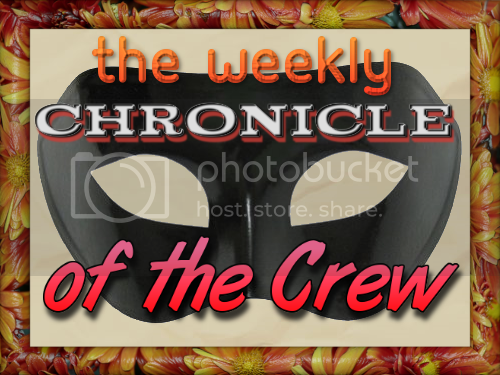 The Crew Sunday Post is now The Weekly Chronicle of the Crew. The Crew Sunday Post had a good run with 43 issues. The rebranded Weekly Chronicle of the Crew will be very similar in some respects, but since I want to introduce new features and alter older ones, the new post will go beyond the scope of the Sunday Post as designed by Kimba the Caffeinated Book Reviewer. Many thanks to her and her meme. She's got a great blog. You should check it out. The first and most obvious reason is explained by ... I guess you could call it a chemical imbalance in my brain. I'm a very logical person, analytical to a fault, so it bothered me to no end when I couldn't get around to posting the Sunday Post on Sunday. Once I did it on Monday, but even as a joke, it rubbed me the wrong way. Isn't the name weekly implying the same thing? Yes and no. My plan is to post every week, but if my schedule doesn't allow it on Sunday, it won't be a big deal. And my psychosis won't have as much of a problem missing a "weekly" post as it would putting a post on the "wrong" day. Don't ask me to explain. Not sure if I even could. There will still be a highlight of the week, or at least some kind of highlight. A list of the most recent book promos, book reviews, meme posts, and such will still be around as well, though I'm toying with different format ideas (as described below). The general look of the post probably won't change. The Amazon Tweet Exchange has been a real big hit, and since I've figured out how to automate it on my end, I don't mind expanding it. I want to use it somehow on the Weekly Chronicle post ... just not sure how yet. Another new feature of this post has to do with the book club. There are quite a few members now, so I'm thinking that each issue of the Chronicle could be geared toward a certain genre. I'm hoping this will increase engagement with the book club members as their weekly newsletter will be geared more toward their personal interests. This does mean that not every book club member will receive a newsletter every week, only if they have signed up for that week's genre. There's another advantage to a weekly theme for the newsletter, and it has to do with a new feature DeeJay has just released via our sister site, Masquerade Tours. Since authors and fans can now takeover this blog, possibly including the Weekly Chronicle, I'll need an easy method to postpone recent posts from being listed on that week's post. If I do it naturally based upon genre, no problem. Easy fix. Does that mean a weekly blog theme is coming back? Not necessarily. The goal for the future of the blog has always included regularly scheduled themes but these won't necessarily coincide with all posts, though for daily visitors, trends can be seen even now. Making these trends more evident is something I'd like to see happen. How this translates to this post and the rest of the blog is yet to be seen. What would you like us to do with this weekly post?